Adding new aluminum bleachers for spectators or replacing old bleachers continues to top the list for many facilities according to an annual survey in a leading recreation magazine. Installing aluminum bleachers continues to be on top of everybody’s wish list as managers strive to accommodate spectators who want safe and comfortable seating. Whether it’s through new construction, additions, or improvements, Recreation Management magazine reports that construction-related spending is on the rise for 2018 throughout recreation, sports, and fitness facilities. Colleges and universities led the way in 2017, followed by schools, school districts, the YMCA, and parks and recreation. All of these institutions have the plans and the budgets to rank them above the national average for these types of facilities. In these cases, the money is there, the plan is in place, and the key is spending that budgeted money wisely. In a survey, when these institution managers list the desired amenities that they would like to see added or put in place, quality aluminum bleachers consistently rank within the Top 5 on their wish lists. In 2017, aluminum bleachers and seating were listed on more than 58% of the facility lists as an item that they wanted. Those colleges, schools, and districts know that quality-made, comfortable, and safe bleachers have been known to make a big impact on users and enhance visits, resulting in more satisfied spectators and patrons that report their venue to be an attractive and enjoyable place to spend time watching sports or other field events. Aluminum bleachers are the most economical, safest, and worry-free way to provide mass seating in a common area, but the process of determining the type, size, and proper configuration for your situation may leave your mouth open and eyes to the sky in a state of confusion or even panic. As daunting as it may seem, the process of purchasing aluminum bleachers shouldn’t leave you breathless. That should be your reaction when you see them installed around your field, shining in the sunlight and transforming your patch of grass into your field of dreams, a lively, rowdy venue with raucous fans and excited spectators cheering on their teams. Follow these guidelines for getting started with your aluminum bleacher purchase. • Look towards safety. Although happening less frequently, bleacher injuries and collapse are still out there. 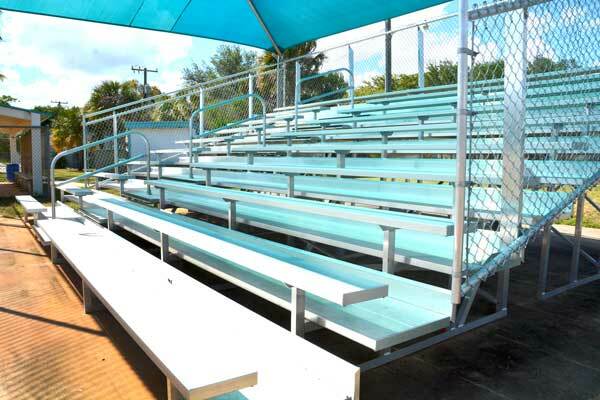 International Building Code (IBC) compliant bleachers are a must for your seating needs. When you think of aluminum bleachers, you think of crowds in constant motion, whether they are traveling up and down the stairs or aisles, to and from their seats from restrooms, and concessions, just jumping up and down in excitement, and cheering, swaying, and stomping to the game action. The loads put on the aluminum bleacher structure are constantly changing due to unscripted and spontaneous population movements and actions. Add potential hazards caused by outdoor weather situations like wind, rain, snow, and ice, and you increase the chances for slips, trips, and falls, the second leading cause of accidental death in the United States behind motor vehicle accidents. 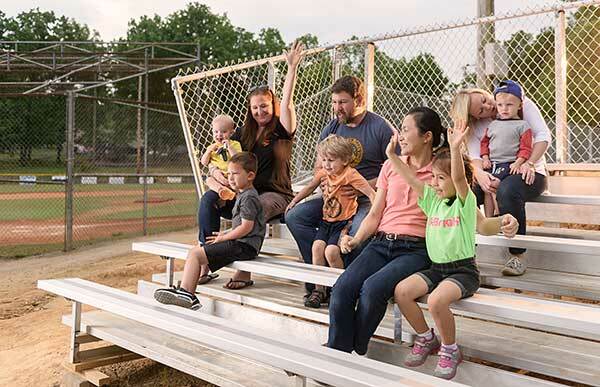 IBC compliant bleachers will be up to the task, meeting code requirements to make your aluminum bleachers safe for the youngest of toddlers to the oldest of grandparents and senior citizens. The ICC/IBC Standards take into account all of the details of the design elements, building and construction standards, and safety requirements that make your aluminum bleachers the safest that they can be under all conceivable conditions. Additionally, these standards will address ADA accessible bleacher issues and requirements, guaranteeing that you are in compliance and meeting all of the needs for all of your visitors. Another factor to consider is slip-resistance and if the bleachers adhere to National Floor Safety Institute standards for the Static Coefficient of Friction. • Decide what type of bleachers fit your needs and budget. Do you need standard bleachers, elevated bleachers for better sightlines and comfort, the tip-and-roll bleacher structure that sometimes can be folded and stored away when not needed, or maybe the transportable bleachers, that can be moved from field to field as needed for seating or used as extra seating in preparation for the big game? Adding new aluminum bleachers such as these that were recently installed by the Village of Palm Springs in Florida is at the top of many facility wish lists. You’ve planned, budgeted, and gained approval to purchase those much-needed bleachers. Use the available styling options to make them fully functional to make the best use of your space and circumstances. • Decking options include semi-closed, closed, or interlocking. Closed and interlocking options allow for easier cleanup, as discarded trash and litter stay on the deck boards rather than falling through to the ground below. Additionally, interlocking decking allows for an easier change in seating configuration in the future should there be a need due to other improvements, additional growth, or added/decreased field space. Semi-closed decking, as the name suggests, allows for openings, less than the size of a 4-inch sphere, but large enough to allow some debris to fall through to the ground below. • Maximize your space while conserving comfort with seating choice. Bleacher seating options include the standard bleacher bench planks or the installation of chairs equipped with armrests. Standard bleacher planks are the most economical and space maximizing, using continuous aluminum seating planks with a standard measurement of 18 inches space per individual seat. This is the most common type of bleacher seating when considering maximum capacity and ease of upkeep. Individual chairs are measured at 20 inches per seat space and allow the convenience of armrests. Available as a fixed seat or folding variety, additional consideration must be given to traveling space in front of the seat as well. Your budget, capacity desires, and specific needs will determine what seating option you choose. • The finish on your aluminum bleachers is the one thing that will make an immediate impression on those that come to your venue. You have a choice of anodized aluminum, galvanized aluminum, and even powder coating to add color, contrast, and uniqueness to the bleachers. Anodized aluminum bleachers offer chip and flake protection, will minimize the spread of rust and require minimal maintenance over a projected lifespan of 20 to 30 years when cared for properly. Galvanized finishes offer protection against corrosion, minimal maintenance, and a similar lifespan while being the best choice for harsh environments. A powder coat finish on your aluminum bleachers, in addition to providing eye-catching color, gives excellent protection against the harmful effects of the environment and elements, including UV exposure, pollution and airborne particles, and harmful salt spray. Powder coated bleachers are also more scratch and chip resistant than their painted counterparts. Adding aluminum bleachers to your recreation center, venue, field or community center is a smart, rewarding decision. It’s no wonder that they are high on the wish lists of recreation managers, athletic departments, and facilities managers. The availability of quality, aluminum bleachers enhance the entire experience of your visitors and patrons, and their usefulness goes beyond simply having a place to sit. The decision to purchase aluminum bleachers is already on the minds and wish lists of more than half of facility managers, so now it’s time to make the detailed decisions that will lead to a safe, beautiful and inviting, yet economical and easy to maintain place for your patrons and users of any age and accessibility to enjoy their time at your facility.